Claim Settlement Ratio is probably the most important factor while buying insurance. This becomes even more critical for Life Insurance as you would like your dependents to run pillar to post to claim your sum assured in case of unfortunate death. 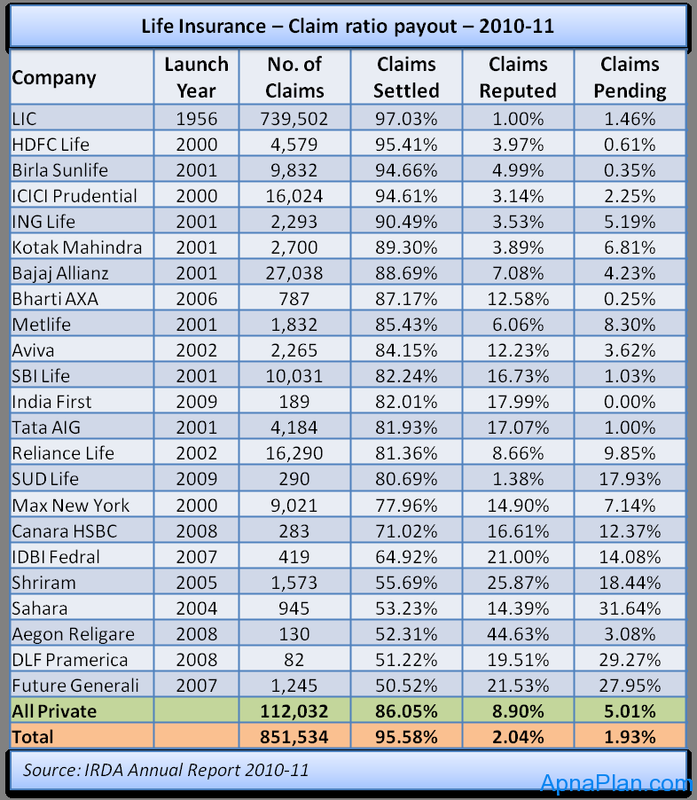 The recently published Insurance Regulatory And Development Authority – IRDA Annual report 2010-11 has the settlement ratio for the following life insurance companies in India. Life insurance companies have a very high rate of rejection in the ‘early claims’ – so if there is a claim made within 2 years of taking the policy, there is a far greater chance of it being rejected. So all the companies which have started operation in last five years would obviously have low settlement ratio. You can read the previous Claim Settlement Ratio for Life Insurance Companies for 2008-09. Buying Life Insurance – Single or Regular Premium? Today I got a called from Insurance Regulatory and Development Authority (IRDA). The person asked me about my policies and my nominee and advised me that surrender your current policy & portability is best option for you. I’ve a Insurance with Kotak ( Kotak Super Advantage Plan) and I pay INR 3000/month from more than 2 years. The person who called me from IRDA asked me that your company “Kotak” is getting down and you will get less amount so it is better if you transferred your policy to top 4 companies of India i.e. ICICI Prudential, HDFC, Birla Sun Life & Reliance. He told me that from this portability you will have total amount in the company which you choose otherwise if you surrender your policy, you will be charged surrender charges and get less amount. We talked about 20 mnts and mostly he advised me to surrender my policy from Kotak and portability in any 4 companies mentioned above. Please help me to know what is this? and is really Kotak id getting down and i should surrender my policy? Hi Aaditya, whats happening with you is FRAUD call. Kotak is still healthy company and you should not worry about that. If you get subsequent calls you can also report the matter to the local police. Here is a notice from LIC warning investors about these fraud calls. 2children below 4yrs of age. Sorry your question was not clear! Dear sir I am 25 years old engineer and right now earning around 29000/month( in hand salary). yet i have not started any kind of investments and also dont have any risk cover policy yet though I am intrested to start my investment and also take one online term insurance plan. But dear sir as a expert please advice me how i should plan to invest 5000/month and also which online term plan i can look for 50 lac sum assured. Some of company i researched for term plans based on low premium rate and claim settlement are. HDFC click to protect,Aviva I term, SBI shield etc need your advice to plan my stretigies . Its a good thing that you have started planning about your investments. I would advise you to buy any of the mentioned term insurance plans online, only if you have dependents. In case there are no dependent you can channelize those into Equity mutual funds, PPF, FD, as per your risk tolerance and returns expectations. 2. Invest in equities if you have a long time horizon (5 years or more) of investment. Take SIP route to invest in MFs. 3. Invest in Balanced funds for 3 – 5 years. 4. Invest in debt instruments for shorter time periods. Let me know in case of any specific queries. The IRDA annual report clearly differentiates death and non-death settlement. Your last statement warning readers to take this data with a pinch of salt is wrong. You are the third blogger after Manish and Shubra to make this mistake! The IRDA report does not have exact numbers for non-death settlements. Where it gives percentages it clearly says it is for death settlement. I truely appreciate your posts on Life Insurance Term Policy and others. Request you to post a Review on Health Insurance Policies available in the markets. I found, there are multiple permutations & combinations of features available and finding it difficult to choose a plan for myself. Thanks in Advance. Would soon write about Health Insurance Policies.